There are some new Italians in Downtown Chicago as the first Fiat Studio in the central core of the urban metropolis is up and running strong. Four other Fiat showrooms already exist in the Chicago area, but this is the first downtown. 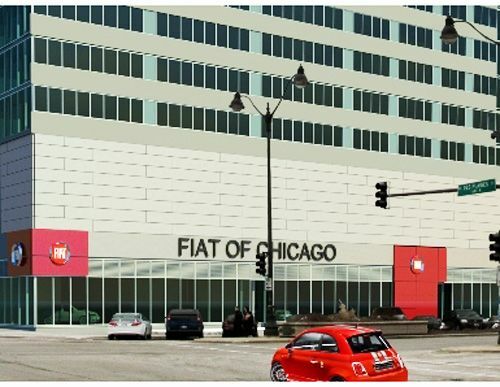 The new Fiat Studio is located at 645 West Randolph Street, just off the Kennedy Expressway, and anchors a contemporary 17-story condominium high rise, so you could say they have a resident group of potential clients comprised of their target demographic – young urbanites - right overhead. The Fiat Studio is family owned and operated by Antonio Scalzo, president, and his son Carmelo Scalzo, vice president. "I heartily welcome FIAT of Chicago to our growing network of FIAT studios," said Timothy Kuniskis, Head of FIAT Brand North America. "With its exceptional location and know-how, FIAT of Chicago will expand our customer reach in this critical market, as we continue to grow our brand nationwide with 178 studios across the United States." The showroom will be the site of a Grand Opening Celebration momentarily, from 6 to 9 p.m. today, hosted by Fiat of Chicago and Chicago Social Magazine. The festive Italian themed evening will feature a fashion show, food, entertainment and a “pop-up” lounge, whatever that may be. Antonio Scalzo is an Italian immigrant himself, having grown up in Calabria, Italy where he worked on Fiats and Alfa Romeos as a young mechanic. He came to Chicago in his early twenties, tirelessly working around the clock to realize the dream of owning a business. Antonio fulfilled his American Dream when, in 1979, he purchased Suburban Auto Imports, a small FIAT dealership in the western suburbs of Chicago, growing it into the largest volume Fiat/Alfa Romeo dealership in the U.S.
FIAT of Chicago opened just a month ago and enjoyed a warm reception from the neighborhood, according to Carmelo Scalzo, who runs the day-to-day operations of the shop. "We think the sky's the limit at this location," he said. "Our customers are excited not only about having a FIAT studio in their neighborhood but also about the return of the FIAT brand to the United States." FIAT of Chicago features up to 25 Fiat models on its showroom floor and stocks another 50 to 60 vehicles, away from the sometimes blustery weather in the metropolitan center at the tip of Lake Superior. The Grand Opening coincide with FIAT new advertising wraps on the Chicago ‘L’ Red and Blue lines that will carry over 21 million riders to their destinations during the next two months. The graphic wrap takes up two train cars, depicting the Fiat 500 Abarth leaving Italy on the left and arriving in downtown Chicago on the right. Between the images appear the words, "The next wave of Italians has come to Chicago." The wrap tie into the new broadcast commercial, Immigrants, that shows the spirited young cars plunging into the Mediterranean Sea for the long journey to America. We thought you might appreciate a look at the video below. After watching it, we felt a sudden craving for seafood. Best of luck to Fiat of Chicago in the new location. If you stop in after reading this, tell Carmelo Torque News sent you.